November 16, 2015: Today the League of American Bicyclists announced 55 new and renewing Bicycle Friendly Communities (BFC). Eighteen communities received their first BFC award, 17 at Bronze and Hennepin County, MN, at Silver. Nine communities moved up to higher award levels, and the remainder renewed at their previous level. "As biking has become more and more popular, more and more communities are committed to creating safer places to bike," said Alex Doty, executive director of the League of American Bicyclists. "Winning a Bicycle Friendly Community designation shows a community's dedication to creating safer and better places to ride your bike." This latest round saw strong growth in the top tiers of the program, as Madison, WI, became the 5th Platinum BFC, joining Boulder and Fort Collins, CO, Davis, CA, and Portland, OR. Madison is the first new Platinum since 2013. “What this says is that any city can be a great cycling city as long as there’s commitment from a broad range of city leaders and the population as a whole. This didn’t come about overnight, it was a decade-long effort. We had support from city leaders, the business community and the thousands of cyclists in the Madison area. The lesson we learned is that it has to be a broad-based effort, it can’t just come from the top.” -- Dave Cieslewicz, executive director of the Wisconsin Bike Fed and former mayor of Madison. Four communities moved into the Gold tier: Austin, TX, San Luis Obispo and Santa Cruz, CA, and Tempe, AZ. There are now 24 Gold Bicycle Friendly Communities. ​There is a strong town-gown connection in the new Platinum and Gold awardees. The University of Wisconsin - Madison was named a Gold Bicycle Friendly University (BFU) earlier this month. Arizona State University in Tempe is also a Gold BFU. The University of California, Santa Cruz, is a Silver BFU, and the University of Texas in Austin is Bronze. But there is much more to the story than a celebration of classic American college towns. The growth of the BFC program demonstrates that communities of all sizes and sorts are harnessing the value of bicycling in cultivating healthy citizens and a healthy, growing economy. The Fall 2015 class of new BFCs includes Brownsville, TX, a border city frequently cited among the poorest in the U.S.; Benton and Washington Counties, AR, one of the most Republican-leaning areas of the state and home to the Walmart Corporation; and vacation destinations like Virginia Beach, VA, Naples, FL, and Fergus Falls, MN. Monona, WI, is the smallest of the new BFCs, with a population of 7,533; Hennepin County, MN, is the largest, with a population of 1.2 million. State and local cycling advocacy organizations are a key ingredient in improving bike friendliness. BikeAustin and BikeTexas were key partners in Austin and across the state. 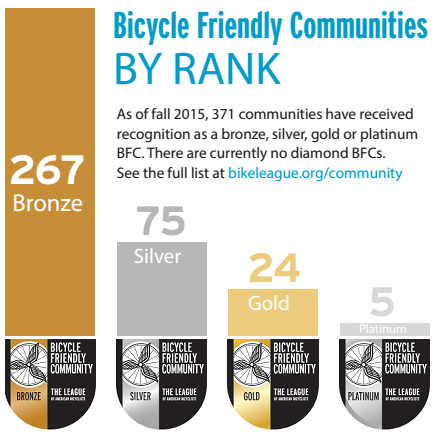 Eight Wisconsin communities received awards in this round, fueled by the Bicycle Federation of Wisconsin's efforts. The state has three new BFCs, three communities moving up, and another two renewing their designations. These new awardees join a leading group of 371 communities in all 50 states that are improving health, safety and quality of life in cities and towns nationwide. With this new round, 72 million people live in a Bicycle Friendly Community. Oconto Falls, Wi. just added bike lanes to there new downtown Main St.
How did Virginia Beach even get considered ? I moved out of that city as it was a good place to get killed on a bike. Please tell me someone contacted the local bike club Tidewater Bicycle Assoc. and discussed this. Rockville, MD has a Bronze rating. It can only be called extremely dangerous. The planning began in 2011 and the city, county and state all have a say in spending so I honestly believe nothing will ever happen. Portland, OR has a Platinum rating. It has no report card. How is that possible?